Suggest that your little fashionista dress in a white gilet and navy star print leggings for a fun day in the park. This outfit is complemented brilliantly with gold sneakers. 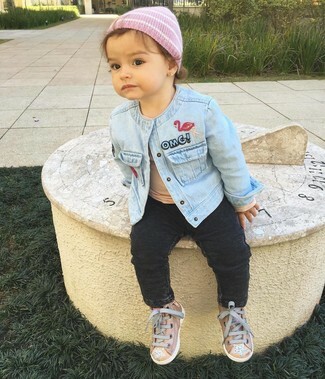 Suggest that your mini fashionista go for a light blue denim jacket and black jeans to create a cool, stylish look. Ash vava sneaker from Nordstrom are a savvy choice to complete this getup. Choose a hot pink print sweater and navy jeans for your girl for a comfortable outfit that's also put together nicely. As for footwear your little girl will love Ash vava sneaker for this look. 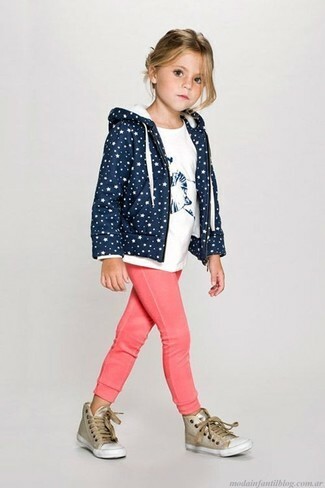 Suggest that your mini fashionista go for a navy hoodie and hot pink sweatpants for a fun day in the park. As for footwear your darling will love Ash vava sneaker for this outfit.